[New for 2013, only at Target, renamed/GMO-Free in 2015] Well well well, now we all know why Berry Voluntary and Brownie Chew Gooder have been cancelled. It was to make room for two new exclusive flavors! Yay for the return of fun names! Wait, a crunchy peanut butter swirl? This will be the best thing ever... maybe... must eat now! Somebody is playing coy with us. Hey, put those car keys down, I'm not done yet! Simply put, the peanut butter swirl is epic. While I may tease Ben & Jerry's about their flat tasting peanut butter cups, I can't make the same jokes here. The swirl is potent and right where I want it to be. Man is it good. It's flavorful, it's a bit salty, and it's just awesome. Why is it crunchy? Well, while only peanut oil is listed on the ingredient list, there are small bits of peanuts in the swirl. The further I went down, the more interesting the pb swirl became. Just look at how thick that swirl is, and notice how it's just breaking apart because of it's solid nature. It's getting really hard to put this one down. Just look at all the swirls! 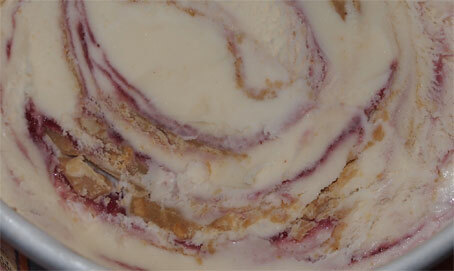 Now the raspberry swirl is really nice too. In fact, it makes me long for the original magic brownies and not the ho-hum encore edition. 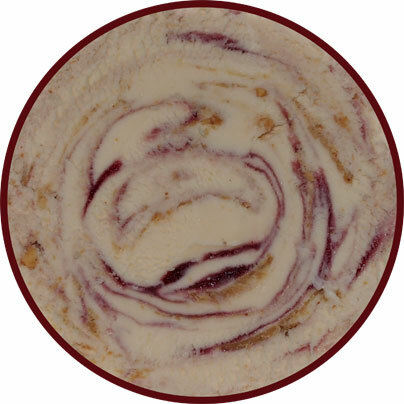 It's just perfectly balanced red raspberry swirl, I wouldn't change it at all. Now the base is your typical Ben & Jerry's texture, though I can only comment so much on this first scooping I am so very distracted by the ever prevalent peanut butter swirl. So much tasty peanut butter flavor, and you all know I adore peanut butter. Now if push comes to shove, the only mildly negative comment I'm going to make is that I'm not sure how I actually feel about these two swirls playing together. For the most part the peanut butter dominates the show here, and that's fine by me. See, I think there is going to be a giant rush of nostalgic people running for their local Target trying to find this flavor. PB&J reminds us of our childhoods, it seems near universal, it's just that PB&J has some unpleasant memories for me, nothing we need to dive in to right now, I know that's not what you are here for. My point is, ignore this final comment, grab your keys, go to Target, and enjoy! History Notes: The original Ben & Jerry's Peanut Butter & Jelly flavor was a short lived flavor, it reads just 1998-1999 on it's tombstone. PB&J had peanut butter "bits" instead of this new crunchy swirl, plus it also used strawberry flavoring instead of red raspberry. This PB & raspberry combo may or may not have been inspired by their current UK flavor Peanut Butter Me Up. Here's hoping this one sticks around a bit longer! Is this similar to their Peanut butter and Jelly flavor they discontinued? sadly I never had their PB&J flavor! Micky, this flavor involves both peanut butter and jelly, so there is pretty much no way they wouldn't be similar. WHY WHY WHY ONLY AT TARGET!!! This looks so good. Sadly this will never be available to people who live in VERMONT! 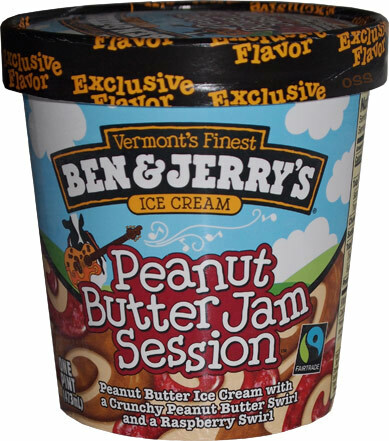 My most fav flavor of all time (I say that phrase a lot hehe) is Wegmen's Peanut Butter and Jelly pint. I wonder how this compares? there's no targets in vermont? how weird! (no offense). time for a field trip to new hampshire! If I recall correctly, there was a flavor in the US called Peanut Butter Me Up, but it was a peanut butter and chocolate combo with a peanut butter core, nothing like the current UK version. @Jane: sorry, took me a second read to figure out what you meant. So you are saying long ago you think they had a US peanut butter core flavor? I know Karamel Sutra has a caramel core, but I don't really recall any other US core flavors. The internet isn't helping at the moment either. @Dubba, yep, that's what I meant! 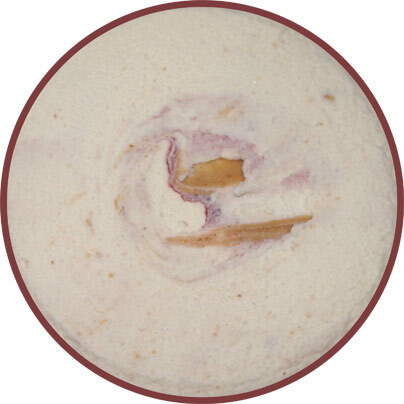 It was released at the same time as Karamel Sutra, and it had a peanut butter core, peanut butter and chocolate ice creams and probably chocolate chips somewhere in there. It is listed on B&J's Flavor Graveyard crypt, but doesn't give a description. I thought this flavor was MUCH better than Karamel Sutra, but I must have been the only one! Here's a picture of the US Peanut Butter Me Up. I wonder what would happen if I tried to order it?? @Jane: found a bit better pic for good measure. Searching my local Target for this one ASAP! Talking about discontinued flavors...if only they'd bring back WAVY GRAVY! That was my all time favorite. Pissed off. Berry Voluntary was my favorite. It's wasn't one of those weird 'out there' flavors. Please reconsider bringing it back. As soon as I saw this post I went to Target immediately! This is so awesome...at first I wished there was a little more of the raspberry swirl, but after eating the entire pint, I realized that the two flavors were perfectly balanced. Thanks for posting! out, but I did like the flavor otherwise. The peanut butter ice cream wasn't too strong and blended perfectly with the peanut butter swirl. I really liked this one. I finally got to try this flavor, and I really enjoyed it. The base was pleasant and the swirls were so flavorful! I even liked the choice of raspberry more than I thought I would. I've heard this flavor is being discontinued, which is a shame and makes me glad I at least got to have it once. @Nick: yeah, we'll have to keep an eye on it to see if it disappears completely. It would make sense that they rotate out a few flavors to make room for the new one.